When is the next concert? What is the Genetic Choir? Wat is het Genetic Choir? a graduation work of Cathalijne Smulders from the Cure Master of Sanderg Institute, Amsterdam. Time: Performances will start at 12:00 and 13:00. Be welcome! Linking nicely with Genetic Choir’s recent work at the Sarphatihuis Amsterdam where we worked with people with somatic, geriatric or psychiatric backgrounds, in this performance piece we will be working with Cathelijne Smulders and Tamara van Scheppingen in a combined exploration of the disruption of speaking and our relationship to space. CIRCLE is an exploration of voices that mirror the boundaries of a space, an utterance, the other and a certain duration. It is part of a series of works that echo, mirror, displace and interrupt a ( ), to (dis)orientate prevailing flows of attention and meaning in favor of a more open, synthetic, porous and affectionate proposition of what ( ) can be. As a new result of the Loop-Copy-Mutate project, the Genetic Choir has been invited to ICMC 2016 in Utrecht, this September 12th-16th. The International Computer Music Conference (ICMC) is the largest, most established international conference for music practitioners working with digital technologies. It is a travelling annual conference, currently in its 42nd edition, which gathers leading researchers, practitioners and artists from around the world working in the academia, industry, or independently in a variety of fields – a.o. music and sound art, interactive art, performance, musicology, human-computer interaction, computer science and engineering. This year back in the Netherlands (after 30 years), it is organised by Gaudeamus Muziekweek and HKU University of Arts, Utrecht. If you would like to read the article that won us the interest of this conference, look here. With the prospect of beginning programming work on the listening software for the Loop-Copy-Mutate project in August 2016, we intend to hold a hands-one workshop on ICMC2016 for SuperCollider programmers and other interested people, featuring Genetic Choir singers and our own programming team. We will update you closer to the time with more detailed information. Tickets for the conference can be bought here. We sent our new CD out prior to its upcoming release (see the 4 december concert), and the first reviews are coming in from colleagues around the globe. This one is from New Zealand born composer Alison Isadora who listened and wrote the following – below some excerpts, the full review can be found here. “The CD starts with whispering before settling into more melodic phrases with a rhythmic accompaniment. Although we can hear that the choir is singing in a church, the voices are always close to us. There is an immediacy to the voices. As with many of the pieces on this CD, the use of a sense of a constant tonality and the presence of ostinato figures offers support for those listeners who may find the vocal adventures challenging. In other tracks dense textures break open into jungle-like screams, croaks and gasps. A drone may give continuity within these rich and varied sonic landscapes. Silence may also act as a musical parameter. In other pieces long slow contrapuntal lines coexist with fast ostinato figures. It is fascinating to hear how ideas develop, how melodic lines are shared, inverted and expanded. A melody that starts life as diatonic may move to a microtonal version and back again within the length of a breath. more info, reserve tickets (and the CD) on this page. January 30, 2012 | Categories: improvisation, performances, workshops | Tags: improv, self-organization, spoken word, text work | Comments Off on Language Choir – concert! 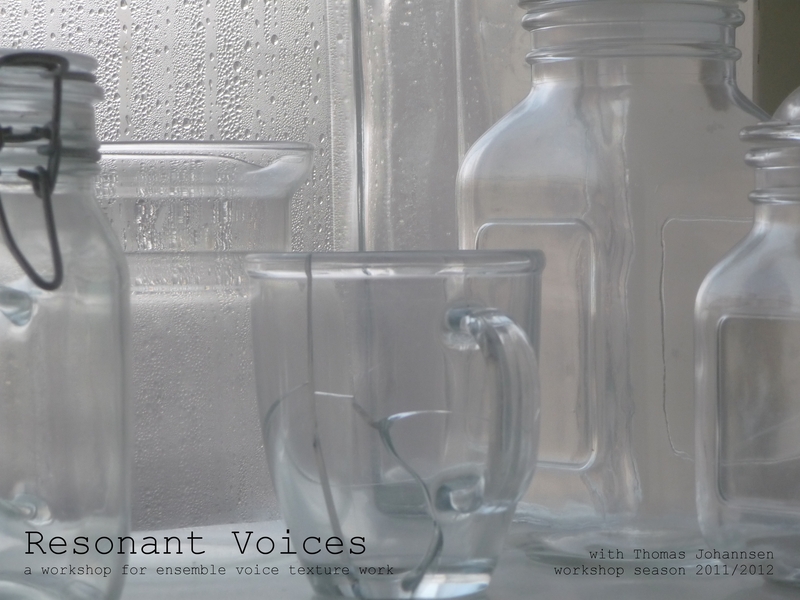 A workshop about sound and silence – working in a group of singers with the complexities of open vowel sounds. The voice is a subtle organ that is interested in it’s own sound.We usually believe that we control our singing and to a certain degree of course we do. But especially when it comes to sound quality, resonances and ‘finding the place’ in a tapestry of sound-textures, our voice is much more subtle and intelligent than us. This might sound odd – “the voice knows what to do?” – , but it simply means that in the direct feedback cycle of hearing and producing sound, our voice can much more intricately steer it’s own sound without us intervening. This has amazing implications, for the individual voice as well as for ensemble sound. The bottom line is that sound understands itself better than we do, and in the complexity of resonances, timbre, upper- and undertones that comprise the human voice, our will is ill-equipped and much too slow to steer that process with adequate precision and subtlety. In this workshop, we will look at the individual and collective process of singing open sounds. We will deal with principles of improvisation and self-organization (structure and freedom – intention, contact and surrender), but in this special case the music we allow will not include melodies, percussive sound-landscapes or rhythms. This limitation to open vowel sounds will open up an endlessly complex space to work in. Your enjoyment of the process of listening will expand, while making the sound more important than yourself in a playful way will allow a more finely tuned awareness to sink into your system. We will engulf ourselves in sound colour, sound texture, resonance, brilliance of sound, natural vibrato, vowel changes and what all this does to the collective sound composition: The polyphonies and clusterchords that will arise from an ensemble finely tuned into sound work. No specific singing background is needed to join the workshop. All levels of experience are welcome. Here is a worskhop completely about words and talking in improvisation! Once words are recognizable, and we enter into strings of words, sentences, poems, dialogues or monologues, it is crucial that as improvisers we are fit for the game. What choices can you make, how do you define your playing field? How do keep focus in what you are doing with all the freedom and possible layers of meaning you end up with? 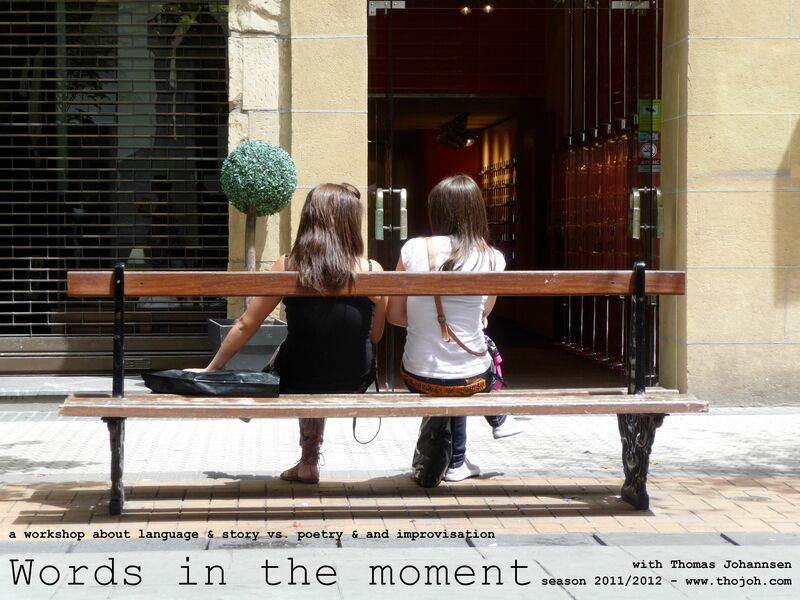 How do you prevent the moment where you (and your audience) is totally lost in the soup of words and sentences? Once we play the game of ‘meaning’ (of concrete verbally uttered images) we have the responsibility to bring it to a meaningful end. (whether that ending makes ‘sense’ in a literal, a poetic or musical way). We will work solo, in small groups and in big ensemble producing pieces of stories, poetic dialogues, language sculptures and wise words. Both workshops are in planning state with the pioneers at the moment. We are looking at dates in the period February-May 2012. If you’d like to be involved as a pioneer – there are just a few pioneer places left, so let us know quickly through the form below, stating the workshop that you would like to be involved in. Once the dates are fixed, you will also be able to inscribe as a normal participant, if there is still room in the workshop group. So you can also let us know already if you’d like to be considered as a normal participant for one of these workshops 😉 We’ll be in touch with you, then! More info on workshops? Click here. - a vocal ensemble based in Amsterdam that sings fully improvised concerts, preferably in unusual locations or venues. - a research garden that is open for people of any background and degree of training to discover their voice and develop with us the craft of vocal instant composition through workhops and sessions. - a utopian idea & hands-on method for creating meaningful music as a large organism of free agents, without a conductor or composer. If next to our 3-monthly newsletter (click the above image for that), you would like to hear more regularly about the Genetic Choir, subscribe below and become a blog follower. Genetic Choir on IDFA in Kleine Komedie this Sunday! 10 hour improvisation concert & Odyssey reading today! We sing the Odyssey, you read! Genetic Choir on Utrecht Impro Night BUI – tonight!